Wild caught in the pristine North Atlantic waters during the peak of quality, PEI lobster is known for hard shells and tender juicy meat. PEI lobster has a distinct position in the market as a gourmet delicacy. Health Fact } PEI lobster is rich in protein and low in fat and carbohydrates. Bring a large pot of salted water to a boil. Place lobsters into water and boil for 2 minutes until blanched. Remove lobsters from pot and place upside down on tray to retain juice. Once cooled, remove tails and claws from bodies; discard bodies. Cut the lobster tails in half lengthwise. Crack claws and knuckles and remove meat from shells; set aside. Heat grill to medium-high heat. Combine melted butter and garlic; brush onto lobster tails. Place lobster tails onto grill (shell side down) and grill for 3-4 minutes; brushing with garlic butter occasionally. 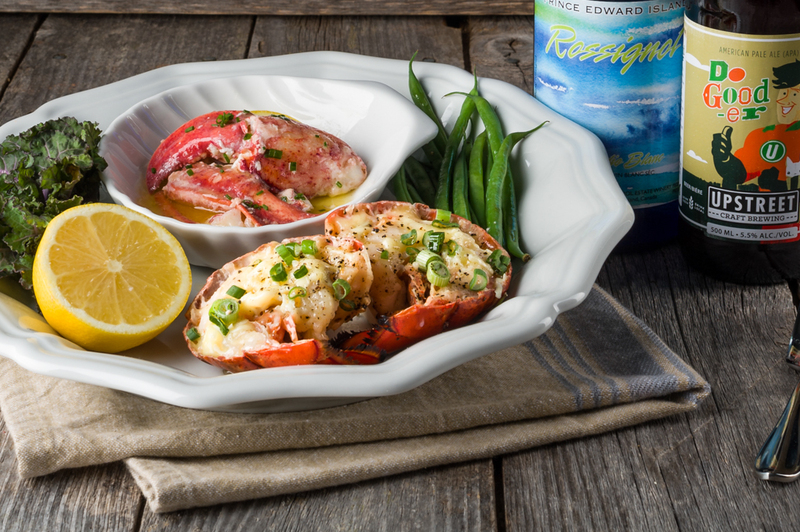 Sprinkle the lobster tails with cheese and scallions and cook for an additional minute or until cheese is melted. Gently sauté lobster claws and knuckles in remaining garlic butter for 1-2 minutes or until heated through. Place lobster tails onto plates and season with black pepper. Divide lobster claws and knuckles amongst plates. Serve hot.